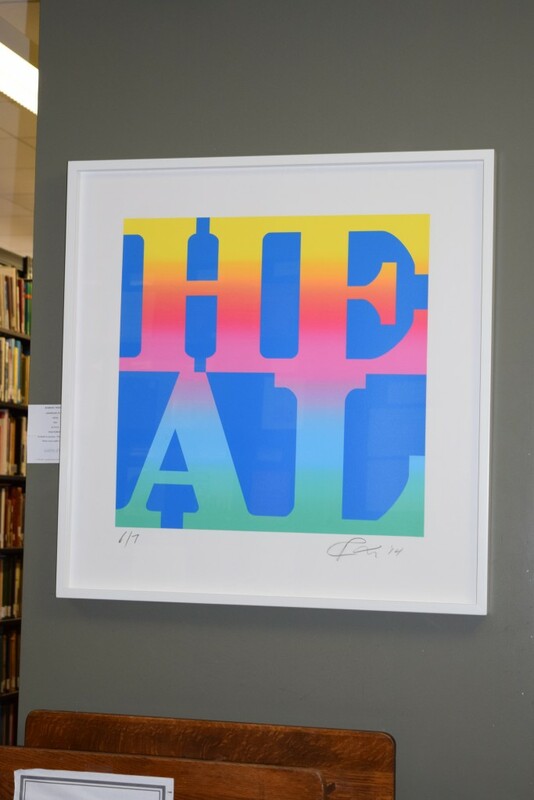 Brilliantly standing out in the middle of the School of Theology Library is “HEAL,” (2014) an original silk screen print by American artist Robert Indiana (b. 1928–). Donated anonymously, this breathtaking print will make its permanent home within our library. The story of how HEAL came to the BU School of Theology Library is about more than just a few people and colorful ink on paper. HEAL has a deep theological foundation. It is a gift to the BUSTH community. May it serve as a reminder of the tender presence and care of divine Love, enabling you to love and to be loved, to hope, to heal and to be healed. The Hebrew Bible refers to love hundreds of times. Christ Jesus exemplified the love of God and healed countless people. The New Testament records the gospel message, “God is Love” (I John 4:8b) and Christians have embraced, studied, prayed with, preached, lived, and healed with the power of love throughout the ages. Christian Science, founded by Mary Baker Eddy, so emphasizes God’s love that the quote, “God is Love”, is written in almost every single Christian Science church sanctuary, and healing is central to the faith tradition. Robert Indiana saw the quote, “God is Love”, in the churches of his youth, and eventually created LOVE, one of the most iconic pieces of pop art ever produced. It has spread all over the world and has been translated into multiple languages. Years later, based on LOVE, Indiana created HOPE and then HEAL. Boston gallery owners, moved by Indiana’s work, curated and displayed his art, trusting that someone would buy and/or donate it to an organization that would be benefitted by the message. BTI students organized a conference dedicated to the topic of healing, and welcomed all types of submissions. Fellow students responded with sermons, papers, and workshops, and one student who happened to see Indiana’s work at the gallery proposed a display for the conference. BUSTH and BU staff embraced the idea, collaborating with students and the gallery to host LOVE, HOPE, and HEAL. A few people who heard about the display offered to donate HEAL to BUSTH, and invited the school community to contribute toward the acquisition. Many responded. May you find your own inspiration in the multi-faceted story and art of Love, hope, and healing. More information on Robert Indiana, and the inspiration behind his world famous LOVE print, can be found here. Around our beautiful library are nineteen framed watercolors depicting biblical scenes painted by renowned British artist Harold Copping (1863-1932). His art brought the Bible to life for millions throughout the world. Boston University is grateful to the Khalili Family Trust for lending the works in our exhibition, given in honor of Boston University President Emeritus John Silber. Dr. Nasser David Khalili (b.1945) began collecting art over thirty years ago and although his interest was mainly focused on Islamic art, he has also gathered exceptional Japanese and Spanish objects and Indian and Swedish textiles. The latter group was exhibited at Boston University in August 2001. Dr. Khalili’s collection, numbering 25,000 objects, is one of the largest known private art collections in the world. However, the Khalili Collection is treated very much like a public art collection: objects are lent for several international venues each year, including exhibitions in Milan, London, Geneva, Jerusalem, and of course, Boston. A host of art historians and other scholars have been invited to study aspects of the collection and their research will culminate in a fifty-volume publication. Dr. Khalili is an internationally recognized scholar and benefactor of Islamic art. He is Professor of Art and Archeology in the School of Oriental and African Studies at the University of London. In 2003, he received an honorary Doctor of Humane Letters from Boston University, recognizing his significant contributions to the world of art. The School of Theology Library proudly displays artwork by American artist Margaret Rigg (1928-2011), artist and art director of the Methodist magazine motive. She taught art at Eckerd College for 33 years and brought the art collection donated to School of Theology Library to other schools, churches to introduce and educate students about the intersection of art and theology. Her art, politics and spirituality woven together like brightly colored thread. The point of her art, she wrote in 1972, is “to communicate even the hidden humor of life, beneath the pain of our struggling lives.” Ms. Rigg specialized in calligraphy, painting, mixed media, print making and sculpture, resulting in more than 60 one-woman shows on four continents. Her calligraphy was featured in CBS specials in 1968 and 1971. Born in Pittsburgh in 1928, Ms.Rigg studied at Carnegie Mellon University and graduated from Florida State University. She also studied at the Art Institute of Chicago and the Presbyterian School of Christian Education, where she received her master’s degree. Along the way, she studied at the Highlander Folk School (now the Highlander Research and Education Center) in Tennessee, considered a training ground for labor and civil rights activists, including Rosa Parks and Dr. Martin Luther King Jr. In Nashville, she worked for 11 years as art director for motive Magazine. She protested segregation with Martin Luther King, Jr.
An early feminist, she helped found the Women’s Resources Committee at Eckerd College and endowed a scholarship for women artists. Ms.Rigg retired in 1998 but continued her artwork and political involvement. Biography adapted from Andrew Meachem’s obituary article written for the Tampa Bay Times in its July 11, 2011 edition. The personal papers of Margaret Rigg are part of our archival collection (search our archival holdings here). We also have digitized motive Magazine; it is available here. Artist John August Swanson (1938-) has donated artwork to the School of Theology Library that speak to themes of social and ecological justice. Through colorful images and compelling text drawn from the Bible and through writings by prominent theologians, poets, and activists, Swanson tells us the stories of those that inspire us to be better human beings. To explore this collection, please reach out to our Archivist and Preservation Librarian. He paints in oil, watercolor, acrylic and mixed media, and is an independent printmaker of limited edition serigraphs, lithographs and etchings. His art reflects the strong heritage of storytelling he inherited from his Mexican mother and Swedish father. John Swanson’s narrative is direct and easily understood. He addresses himself to human values, cultural roots, and his quest for self-discovery through visual images. These include Bible stories and social celebrations such as attending the circus, the concert, and the opera. He also tells of everyday existence, of city and country walks, of visits to the library, the train station or the schoolroom. All his parables optimistically embrace life and one’s spiritual transformation. Mr. Swanson’s art is represented in the permanent collections of many museums, including three museums of the Smithsonian Institution: The National Museum of American History, The National Museum of American Art and The National Air and Space Museum. He is also included in the print collections of the Art Institute of Chicago, Harvard University’s Fogg Museum, the Tate Gallery and Victoria and Albert Museum in London, and the Bibliothèque Nationale in Paris. His painting THE PROCESSION is one of relatively few works by contemporary artists to be selected for the Vatican Museums’ Collection of Modern Religious Art. In 1951, University Trustee Percy Woodward donated his large collection of art, mostly Asiatic with some Egyptian and Meso-American, to the University, most of it finding a home in the School of Theology Library. This collection of statuary and artifacts from non-Christian religions mostly in Tibet and China show the diversity of human religious iconography. Explore the artifacts from the Percy Woodward Collection here. See our Archivist and Preservation Librarian if you wish to access any of the art in the Percy Woodward Collection. To reiterate, this is only a selection of our holdings, and not our entire art holdings! Some of our artwork is currently on display (for example, the Copping watercolors, Robert Indiana's HEAL, and some of Margaret Rigg's art). Furthermore, we frequently have exhibitions of artwork that we own (e.g. a January 2016 exhibition of posters by John August Swanson). Artwork not on display is available in the research collection. Contact the Archivist and Preservation Librarian (617 353-1323 or kjackman@bu.edu) for more information. An appointment is necessary to view items in the research collection.